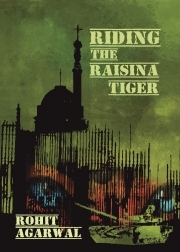 Description of "Riding the Raisina Tiger"
The story of Gen Raghavan, an upright, no-nonsense soldier who is looking forward to a peaceful retired life. An unexpected turn of events leads to him being appointed as the chief. He finds himself in confrontation with the prime minister, who is leading an unstable, corruption ridden government. He learns that the prime minister is planning to take certain decisions that would be irrevocably harmful to national interest. When his attempts to convince fail, he decides to take things into his own hand. Reviews of "Riding the Raisina Tiger"
An excellent yet no nonsense book by an Ex Army Officer. Weaving his magic by creating a simple yet deep story interwoven with events that actually took place. A what-if scenario which was plausible with twists and plot changes that make it a compelling read. Nice to read on an airplane. His book restarted my love for books. A must read for Armed Personnel mainly because of the greatest twist in the plot. Looking forward to the next book by Col Rohit Agarwal. A fantastic literary effort. well researched and lucidly written. Extremely engaging plot. End game cleverly woven around recent landmark events. Really wish some upright General really takes charge like Raghavan in real life...maybe the country really needs it...looking forward to the next from the author..